Theresa [my daughter-in-law] and I have itchy feet; we really really want to travel. Destination not that critical. Having reefs and fishes, though really fires us up. So, itchy feet in flippers? The thing is, we are comfortable with each other’s silence. I have concluded that that is even more important than a sense of humor, which we also share. And she tolerates my snoring! Theresa and I were quite pleased this time to have 3 snorkel days. 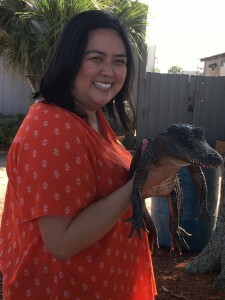 Last trip we had a day in Port Canaveral FL, where we saw alligators, had some beach time and shopped. Great fun, but no snorkeling. But this time, we had a stop in Princess Cays. As there was no dock for the ship, Carnival Pride stood out in the bay, and passengers took a large water taxi ashore to a gorgeous beach resort, owned and operated by the cruise company and leased from Eleuthera Island, Bahamas. We took a bus tour of the lower part of the island and then were dumped for 5 hours at the beach. The tour took us to 2 “blue holes”. These are ocean pools in the middle of land; there are a lot of them in Mexico. 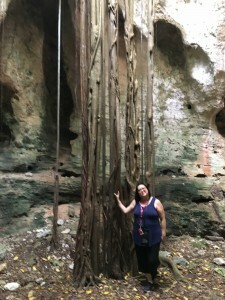 Since I never want to go to Mexico again, I was thrilled to have this chance to see blue holes. These were not really blue, although the guide told us they are from the air. Algae grows on the rocks, and fish live in them. Jacques Cousteau dived these 2 and found no bottom. Meaning they pierce the island all the way to the ocean. So the blue holes are tidal as well as briny. The first hole, “boiling Hole”, was our favorite, as there was a cave system attached. Some blue holes are formed when a cave roof collapses. This looked like the case with Cathedral Cave. The remaining roof was pierced with windows of all sizes and 30 foot roots from the weeping fig [?] trees above. Tiny bats were hanging in the darker grottoes and the acidic small of guano was present but not unpleasantly so. 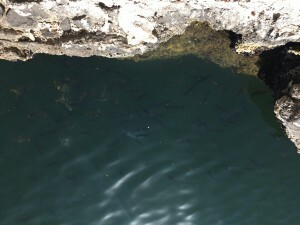 The other blue hole, Ocean Hole, had no cave but had lots of large fish, and small boys, swimming. Returning the Cays, we headed directly for the ocean side of the resort, set up near the lifeguard and got his advice on where to snorkel. He actually walked over once we were going in, to show us in person! We needed the guidance; the tide was going out and the nearest reef rocks were very near the surface. Theresa had learned how, once you put on the flippers, to walk backwards into the water. This is awkward as all get-out, but much more dignified than trying to walk face first. [Which often cause you to fall on your face.] Snorkel vests were a requirement on this beach. Not much inflation is needed, but the vest helps keep you from being swamped by waves or people splashing. We both had corrective lens swim masks. We began to swim in mere inches of water, and nearly kissed the rocks a few times, but I pride myself that we looked at least competent. I’ve been in training at our health club for 18 months, with fins, snorkel and swim gloves. This paid off very well indeed. The water was cold enough and rough enough that I needed my swim aids. But OH, THE FISH!!! 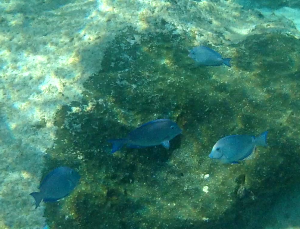 Yellow, electric blue, indigo, purple, striped, spotted, narrow, wide and everything in between fish swam beneath us. I saw tiny fish cleaning bigger ones at “service stations.” These are coral clumps where the tiny fish are protected and the larger fish a hover to get mites and dead skin removed. Purple fan coral, brain coral and dozens of ugly brown coral flourished. The limestone rocks were covered in a soft brown fur of algae. There were little lollipop shaped coral (?) growing. The rocks were often cut away beneath, leaving fish-sized caves to hide in. 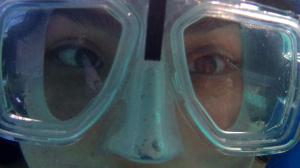 I am very noisy breathing through my snorkel, so many of the fish were leery of me. But few were really afraid, and they let us float over them. Theresa actually reached out and touched them, and picked up hands-ful of hermit crabs! We spent an hour in amazement, before raging thirst drove us to shore. We had a rather nasty lunch (included) and lots to drink ($). I also bought some spray-on sun screen, as we were reluctant to rub lotion into the sand all over us. Then right back into the ocean. The tide was even further out and we really had to thread our way among the boulders to get out to the deeper waters. 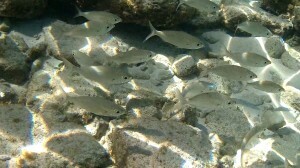 There were actually fewer fish out and about; perhaps there was too much sun in shallow water for them. Still an amazing show. With about 1 1/2 hours to go, we just had time to swim the shallow lagoon, knowing there would be few fish and lots of capering kids. But we discovered that the far side of the lagoon had rocks and reefs in very shallow water, but was swimmable. I was puttering around, when a moving shape caught my eye; it was an octopus!!! It’s amazing how I could yell “oh my God! !” 15 times under water, and hear myself. (Not blasphemy, it was a prayer of gratitude!) About 8” of octopus was visible, but it squished into a crevice until only the eye, with the distinctive lambda shape was visible. I hovered there so long that Theresa came over to see if I was dead, and so she saw the eye as well. But he would not come out. We motored back to the ship, exhausted but triumphant.